Buy. Download. Create. Get Adobe Photoshop now at the Adobe Store. 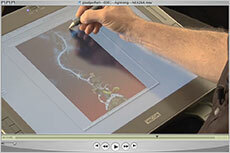 Find Photoshop CS4 tutorials and videos on our Photoshop CS4 Tutorials Page. Bert Monroy  a true Photoshop Guru (see him in our Inspiration section)  is considered by many as the finest photo-realist painter working in the field. To see his work is awe-inspiring, and the detail that he can achieve is almost frightening. Below you will find a recent online Interview. You'll also find links to his step-by-step Photoshop Tutorials and to his Online Galleries, and info on his latest Photoshop Books. Enjoy! Digital artist extraordinaire Bert Monroy has created a podcast titled PixelPerfect that is distributed through revision3.com, a new site associated with Kevin Rose from TechTV fame, on which Bert was a frequent guest. The first thing about this podcast is the quality- which is super clear, HD perfect, and delivered in a nice widescreen format. But the best part is that Bert spends lots of time explaining all the various details in his creations, making sure you understand Photoshop concepts and tools as he goes along. PixelPerfect is a totally professional, totally enjoyable podcast, and a great resource for any aspiring Photoshop artist  and at over 15 minutes a piece, this is a pretty amazing training freebie! Episode 1 - Using Photoshop in fantasy art  Create lightning, sparkles, and a mystical vortex the same way professional effects and movie matte artists do. Episode 2 - Patterns and Animations  Watch as Bert teaches how Photoshop is also capable of animation. Listen to this Inside Mac Radio Interview with Bert Monroy (it loads as an MP3, lasts 39 minutes, and is 4.5 MB). Bert discusses how he started going digital in 1984, first with the MacPaint program, then with the first version of Photoshop. He also talks about how some of his individual canvases can take over 130 hours to complete. Also find a sample at creativepro.com - Reflections and Shadow. 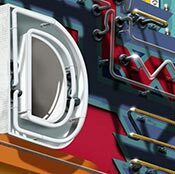 Bert Monroy shares tips on creating realistic reflections and shadows in Photoshop. Fine Art contains digital paintings that were created entirely in Adobe Illustrator and Photoshop without the use of scans. Make sure to click where is says "click on image for detail" to see why Bert Monroy is truly a mad genius. The Commercial Work gallery includes Ads, Products, Covers, Posters, and Web and Interactive work. You can also purchase a limited edition, original digital Iris print of many of the paintings. All prints are created on 140# Arches Cold Pressed Watercolor paper. Each print is hand signed by the artist and numbered. Bert Monroy has long enjoyed successes as a digital artist, and is a well-known and highly regarded expert in the Photoshop community. He has received heavy exposure on TechTV in the past year and his reputation as a master teacher of Photoshop and digital illustration has grown dramatically as a result. In this newest book, Bert switches from sharing the secrets behind his personal portfolio to unleashing the Photoshop tips he uses when working on commercial projects. This book is complete with case studies that walk readers step by step through the commercial design process  including concept creation, digital editing, production, and working one-on-one with clients. Whether you're looking to better your Photoshop skills, break into the field, or are simply a fan of Bert's work, this book will not disappoint. PHOTO CREDIT: Section of "HAMBURGERS" by Bert Monroy.